This is a story of two women on a journey of survival, through laughter and tears as they ‘swim and gasp for air’,Airswimming will be in the Basement Theatre Thursday , Friday and Saturday, 9, 10, 11 October at 8 pm and Sunday 12 October at 3pm; then the following week Thursday, Friday, Saturday, 16, 17, 18 October at 8pm and Sunday 19 October at 3pm.Major sponsor for the production is the Mantra Pavilion Hotel. Book your tickets now at the Civic Theatre Booking Office or get a group together to take advantage of the special group booking rates for 10 or more, available through the School of Arts office phone 6921 2594. Director of Airswimming is Diana Lovett with Catherine Dawson and Grace Nicholson in the roles of Persephone (Porph) and Dora (Dorph). 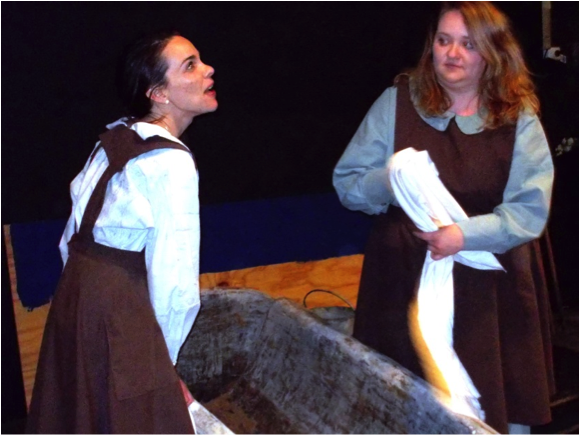 Says Director Diana Lovett: “Based on a true story, Airswimming reflects the journey of two women, a Miss Kitson and a Miss Baker, who were incarcerated in a mental hospital for the criminally insane because they were women with human failings. They were released in 1974 having spent 49 years and 51 years respectively in the hospital. Airswimming will have you laughing and crying as you reflect on the injustices and the nightmares these women endure.” Persephone (who is obsessed with Doris Day) and Dora (a walking encyclopaedia on military history) will have audiences laughing and crying as they ‘swim and gasp for air’. BELOW: Catherine Dawson and Grace Nicholson get into character. I thoroughly enjoyed seeing this play last weekend, I am amazed at the professional quality of actors that our town can produce and I just loved the script, heart – breakingly funny.